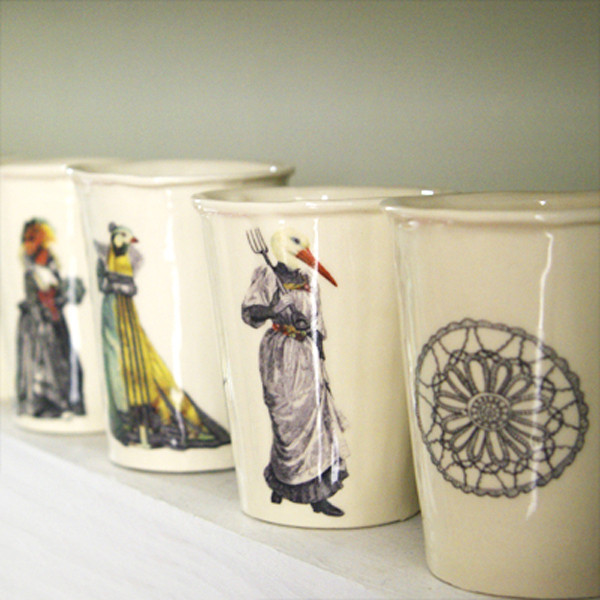 FK chat to the lovely ladies Peta & Rebecca, behind homewares label Two Birds Four Hands. Two Birds Four Hands is a creative collaboration between Peta Misbrener and Rebecca Davis. 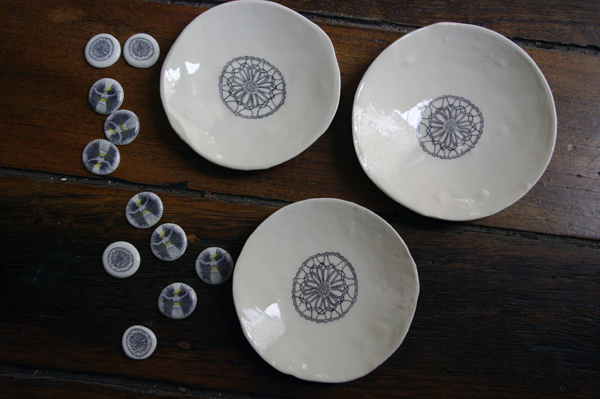 We make porcelain jewellery and homewares, screen print tea towels and design and make cards and blank journals. Our name describes us as two ‘birds’ who just love the beauty and sensibility of making things with our four hands. We’ve launched our business with two distinct visual styles. 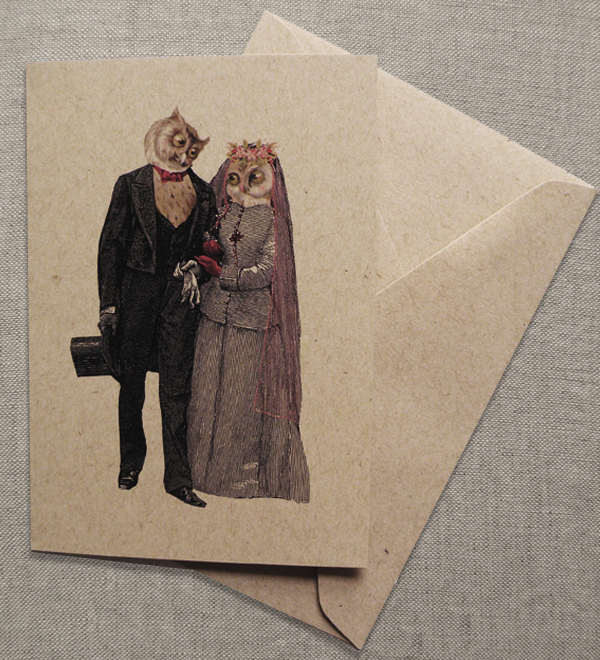 We have our vintage bird style that combines our quirky illustrations with etchings. There’s also our ‘drawn from life’ series of images that feature our line drawings. We are both graphic designers so it’s very liberating for us to produce beautiful wobbly edged cups or wiggly line drawings. 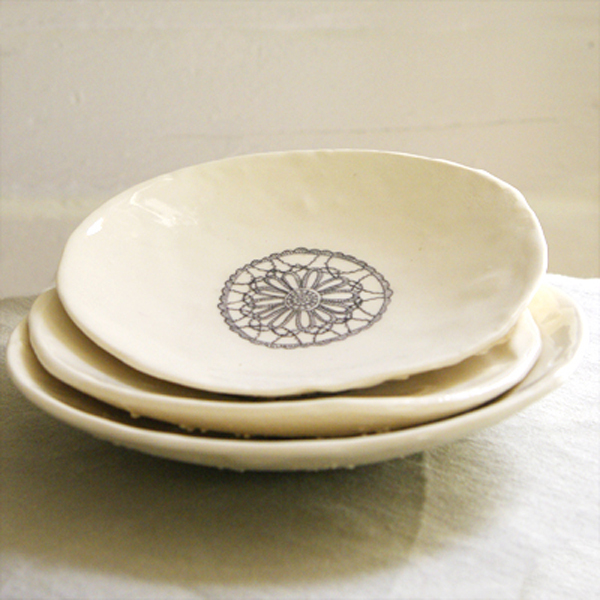 We love the wabi sabi factor in our hand made objects and we think it enhances the fascination and beauty of our work. Rebecca has degrees in Fine Arts and Visual Communications. She has always loved drawing and making things and has recently completed courses in resin jewellery, fabric printing and bookbinding. She has a 4 yr old daughter and 2 yr old son. Peta has lived and worked for many years in London and then relocated to the Blue Mountains after having her daughter. She completed a short pottery course and learnt how to successfully combine her amazing design and illustration skills with porcelain. 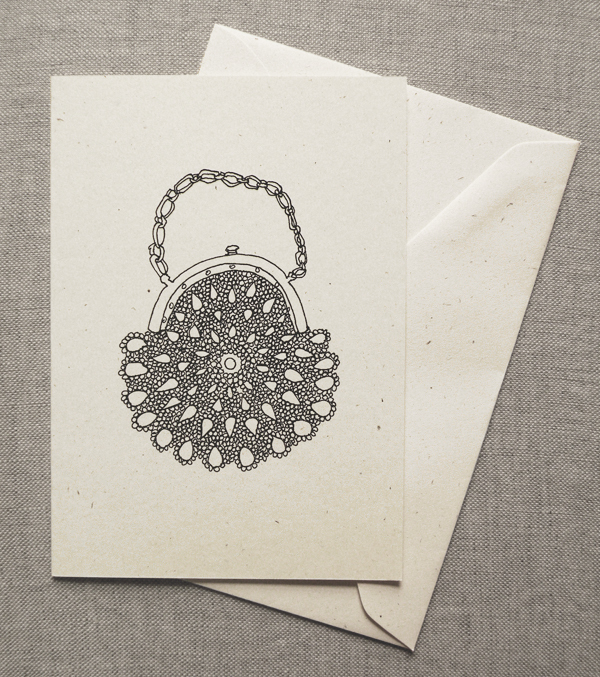 Peta also produces stunning work under her other business name Elm Design. We have been working together for over 5 years as graphic designers in the Sydney CBD and in this time we have developed a great friendship and creative connection, enjoying each other’s humour, aesthetic and drive. We kept saying ‘we should do something together’. And now we have. Two Birds Four Hands has been in its nesting phase for most of this year whilst we developed our designs, earned a living and managed our young families. The Finders Keepers was where we hatched and learned to fly all on the same weekend. Being accepted in October was the catalyst for us to move into production mode, to refine our business skills and to launch our business. It’s been really challenging and exciting and we’re very proud of what we’ve been able to achieve in such a short period of time. You recently did the FK Sydney markets – what was the reaction? The reaction to our work was amazing – overwhelmingly positive in fact. We produced a lot of work in order to gauge customers’ preferences. The most rewarding part of the whole experience was watching people’s smiles spread across their faces as they picked up our work. We of course wore our jewellery over the weekend and on the Saturday we met two lovely ladies who were thinking of buying one of our pendants, but deferred because they had just arrived and wanted to keep looking around. The design they liked had been selling really well and we only had a few left so Rebecca jokingly promised to sell the one around her neck if we sold out by the time they came back. We sold the one around her neck and took orders for more. What websites & blogs are you loving right now? What have been some challenges about the collaboration, and some rewarding aspects? One of our challenges is that we live in different locations: the Inner West and the Blue Mountains. Fortunately there’s great technology out there these days and we can Skype for face-to-face and show-and-tell. We email our images and designs back and forth. We work in the city together so we see each other every week where we brainstorm, exchange ideas, have a few laughs and drink lots of coffee!!! The rest of the time it’s phone chats and visits to the city or mountains. The rewards are many. The feedback and company is awesome. Sharing ideas is really rewarding and we have a lot of laughs. Graphic design is a shared skill and then we have individual strengths, experience and knowledge that we each bring to the business. It’s great to share the business costs and share the load when organising things. We both learn a lot from each other and share a similar drive to succeed. It’s a very inspiring collaboration! What new things can we expect from Two Birds, Four Hands coming up in 2012? 2012 is shaping up to be an exciting year. We are planning a few more markets and will be participating in Melbourne’s Design Made Trade – State of Design event in July. Right now we’re busy building our website. We are opening our online shop through Blue Caravan this week. 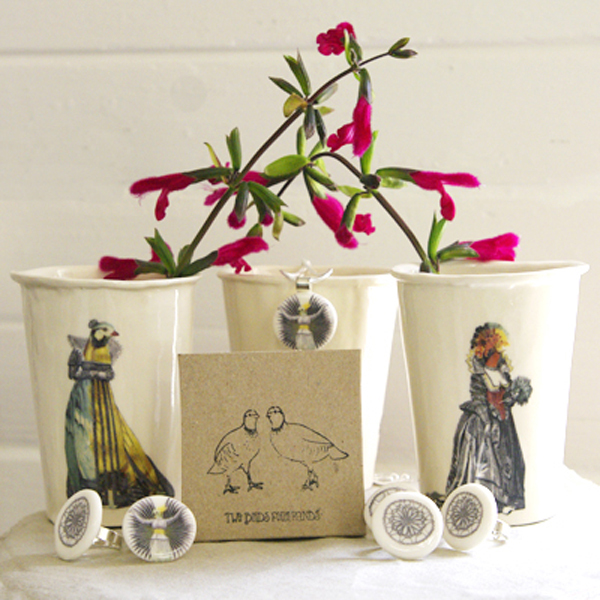 We are making more jewellery and homewares products using our current designs. We have oodles of ideas that we are currently keeping warm in our nest and hope to produce in the near future.